Sticking with the theme this week of recipes from my childhood, here's another one. 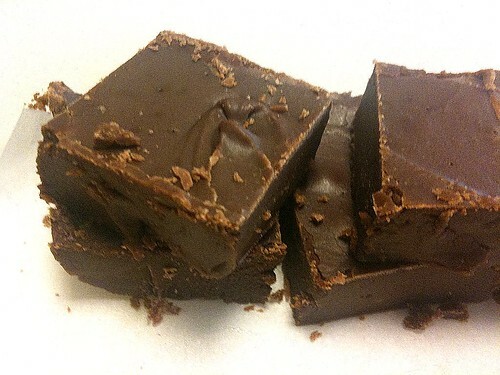 This is "Gram's Fudge" and has graced our holiday table for a very very long time. My Gram (aka Grammie), who passed away in 2003, is one of the most important people in my life. I miss her everyday even though I know she watches over me. My mom took over the tradition of making the fudge when I was younger and if she doesn't make it, people get upset! It's a family legacy. This recipe is naturally gluten free but contains butter and milk. I have never made this recipe even before going GF/DF but lately I've been so inspired to re-create the oldies that I just had to try this one. This recipe is made using a double boiler and I don't have one. I wanted to make this fudge to bring to my secret santa party at work and of course waited until last night, thinking I could just stick a glass bowl over a pot of boiling water as a makeshift double boiler. Well I got home from work, ingredients in hand, and grabbed the glass bowl that in my mind would work in this scenario only to find out that, well, it wouldn't work. No way, no how. So off to Wal-Mart I went, with a $5 gift card to boot. But... apparently people don't use double boilers anymore? I couldn't find one anywhere. I wandered around the kitchen section forever, I couldn't even find a sufficient bowl!! FINALLY I found a nice big metal bowl that would work perfectly. And a few other things I didn't need, I swear the kitchen section is my kryptonite. Moved swiftly through the checkout line, got in the car and headed for home. With the $5 gift card still in my wallet. Darn. This recipe is SO EASY. Put enough water in the pan to boil but not touch the bottom of the bowl that you nest on top. Or use a real double boiler if you have one. Put the butter in the bowl first and let it melt. Then dump the rest of the ingredients in the bowl and stir until there are no lumps left. Pour into an 8x8 greased dish or foil pan. Let chill in the fridge overnight. Plan to share with friends so you don't eat the whole pan of fudge by yourself! I LOVE chocolate fudge! I have all the ingredients except So Delicious coconut milk. I do have some So Delicious coconut milk creamer, so I'm going to try making it tonight with that! Thank you for the EZ recipe! Wow, that looks so good! Love, love fudge. I keep looking for So Delicious Coconut Milk and Canada, so far have not seen it, do you think regular canned coconut milk would work?